Brazil has long enjoyed a unique role in the variety of music. From traditional sounds to the popular tones created by such prolific songwriters and musicians as Joao Gilberto, Flora Purim, Antonio Carlos Jobim, Djavan and Milton Nascimento, and from bossa nova to the adoption of these styles into the mosaic that is North American jazz, with an array of artists using their experiences in Brazil to create wonderful music. Among that latter group are Stan Getz, Herbie Mann, George Duke, Maynard Ferguson, Spyro Gyra, David Benoit and Lee Ritenour. Saxophonist Sergio Galvao, whose home base is Rio de Janeiro, has spent many years as a composer and in-demand session player. 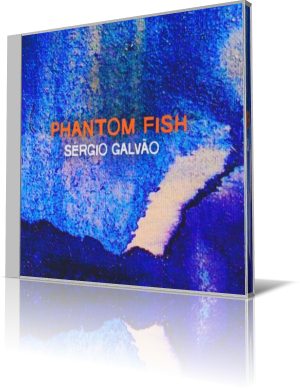 Now, at age 48, he debuts as a leader with Phantom Fish (Pimenta Music, 2013). The core trio is Galvao on tenor and soprano saxophones, Amanda Ruzza on bass and Mauricio Zottarelli on drums. An assortment of other musicians is spread among selected tracks. The album is produced by Ruzza, a fellow Brazilian who now resides in New York City. “Amphybious” features Leo Genovese on piano and Rhodes, and Alex Nolan on guitar. Tenor and guitar blend on the opening sequence with the other players contributing softly underneath. After a freeform pass in which everyone seems to focus on a separate task toward accomplishing the same goal, the song transitions. Galvao puts the tenor through an expressive workout. While wowed by the lead, the listener can also feel the energy and enthusiasm by the other musicians, particularly Ruzza and Zottarelli. Genovese tickles the ivory during one sequence, accompanied by the subtle play of bass and drums – play which intensifies as the piano stretches out farther. Nolan’s solo has a Mike Stern quality. Galvao turns to the soprano on the title song, which also features Nolan, Aruan Ortiz on piano and Rhodes, and Brazilian trumpeter Claudio Roditi. All the players are fully locked in, but it’s Roditi’s calm, Herb Alpert-like play, paired with Ruzza’s thick bass lines that give “Phantom Fish” its teeth. The upbeat rhythm is like a hybrid of samba and salsa. Seven of the eight tracks on Phantom Fish were composed by Galvao. Ruzza arranged all eight. The partnership began when Ruzza hired Galvao for some gigs with her group. “Sergio showed up and played my music better than anyone else in the band,” Ruzza says. They became instant friends, and the following year, Ruzza proposed documenting Galvao’s sax playing and fully realized compositions.